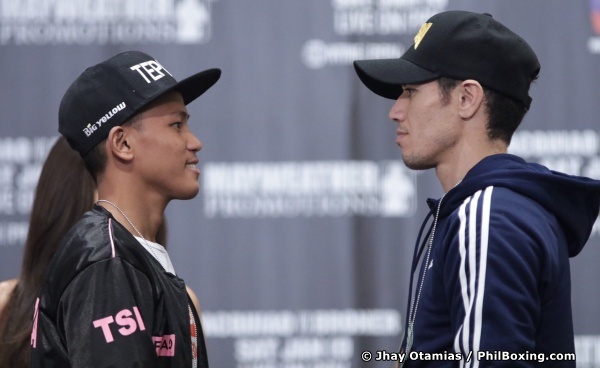 LAS VEGAS – WBA Interim featherweight world champion Jhack Tepora of the Philippines and his challenger Hugo Ruiz of Mexico promised to knock each other out when the two have came face to face for the first time during the Pacquiao-Broner undercard press conference held at the media center of the MGM Grand Garden Arena here Thursday afternoon (Friday morning in Manila). 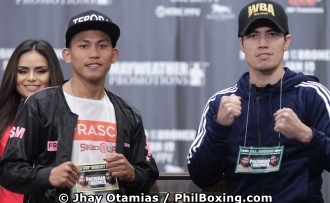 The Tepora-Ruiz world championship matchup will open up the four-title-fight PPV televised card headlined by Filipino boxing legend Manny Pacquiao who will stake his WBA welterweight title against Andrien Broner of the United States. Jhack Tepora (L) and Hugo Ruiz come face to face during Thursday's Pacquiao-Broner undercard press conference at the MGM Grand Hotel & Casino in Las Vegas. Photos by Jhay Otamias. Tepora, who had a falling out with his management team at Omega Gym of Cebu, came here accompanied by his wife Dina and brother-trainer Christopher 'Pingping' Tepora. Tepora arrived in Los Angeles last week with still 20 pounds over the featherweight limit. According to Pingping, Jhack is still six pounds over as of today and needs to shed it in the next 24 hours to avoid being stripped of his title. Also on the televised undercard is the bout between Rau'shee Warren of Cincinnati, OH and Nordine Oubaali of France of the WBC world bantamweight championship. In the co-main event, Badou Jack of Las Vegas via Stockholm, Swenden faces Marcus Browned of New York for the WBA Interim and WBC Silver light heavyweight championship. The highly anticipated main event is between eight-division world champion Manny Pacquiao against four-division champion Andrien Broner for Pacquiao's WBA world welterweight title. The weighin is scheduled at 2:00 p.m. Friday (Saturday morning in Manila) at the MGM Grand Garden Arena.